Katie’s turning 10, Molly’s getting married, Uncle Bill is retiring, Mom and Dad are celebrating 50 years together, and Sophie’s having a baby. So many occasions to celebrate and so many parties to plan! For all of us papercrafters, before the balloons can be inflated and the cake can be made, the invitations need to be created. 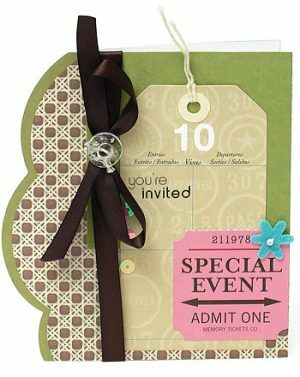 Check out this beautiful gallery of inspiring invitations and make your next party truly memorable. Add 3 eyelets above the chimney and some fun stick pins in the bow on the front of the card. Make a 5.5” square card from white cardstock; round corners. Cut a 5.25” square piece of green paper; round corners. Cut a 4.75 x 1” strip of blue paper. Cut a 4.75 x 1” strip of white cardstock; cut one long edge with a border punch. Cut a 4.75 x 2” strip of floral paper; round top and bottom of left side. Adhere all layers to left side of card as shown. Machine stitch around outside edge of green paper and down the center of the blue strip. Die-cut purse from hounds tooth paper. Adhere with pop dots on a 2.25 x 3.25” piece of white cardstock. Mat white piece with a 2.5 x 3.5” piece of black paper; zig zag stitch around outside edge of white paper. Stamp sentiment on white cardstock; mat with black strip and then with green strip; Adhere as shown. Add a narrow piece of black ribbon where floral print meets scalloped strip; tie in a knot and secure with adhesive. Print journaling on 5 x 7 red cardstock. 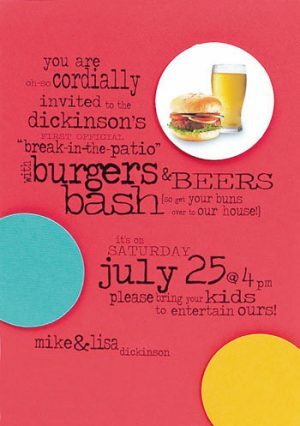 Print stock photo on photo paper and cut out using 2″ circle cutter. Cut 2″ circles from aqua and yellow cardstock. Adhere circles to red cardstock using foam squares. Trim edges of circles where they hang over the card. Make 3 1/2″ x 6 ” card base. Stamp “You’re Invited” image twice. Layer over Baja card stock and then on to card front letting extra hang beyond the right edge of the card front. Stamp “It’s a Party” on 2nd image and punch out with 1″ circle punch. Apply to card front with a dimensional. Apply a 1″ strip of olive card stock, letting that extend also. Place five 1/2″ Summer Sun circles onto strip. 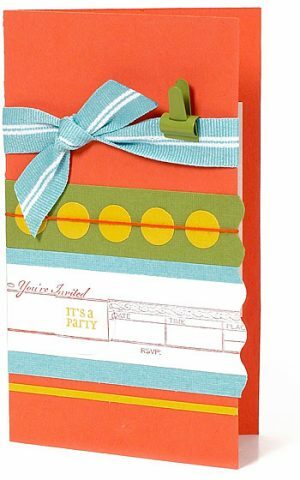 Add thin strip of Summer Sun to lower part of card front. Slit an opening for the ribbon and tie, place library clip. Cut card base 4 1/4″x8 1/2″ for a square card once folded. Punch circles in coordinating colors. Lay circles on card and stamp sentiment. Adhere circles with foam adhesive to card front. Adhere die cut butterfly to front of card with glue dot. Adhere coordinating buttons to the front of the card. Cut standard size card from white cardstock. Cover with die cut paper. Trim a square of green print paper and apply to upper right side of card. Place special event ticket on right edge and add flower. Tie ribbon around card and add clear button to center with floss. Apply “you’re invited” rub on.